Under Mao decisions were often made on the basis of whims, biases and ignorance, often without careful study of their impact or considering the human and environmental costs. Features of the revolutionary era's mass politics included flamboyant and typically baseless scapegoating, slogan-based campaigns aimed not just at inciting the fury of the masses but at channeling it against ever-shifting ideologically designated “enemies,” and vicious and often unrelenting sectarian attacks. "Mao's contradictory insistence on the absolute loyalty of his subordinates," wrote historian Marilyn B. Horne, "as well as their absolute honesty insured that only the subservient prevailed." 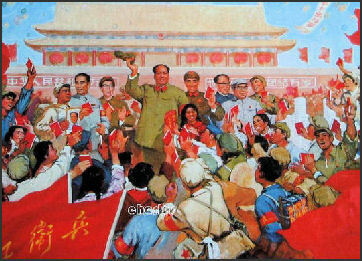 Mao anointed and then purged several “Number Two” men and apparent successors. The Mao Marxist revolution set to create New man, who prosper in a society where class distinctions had been eliminated and progress was defined by dialectal reasoning. The economic reformer Zhao Ziyang wrote that in Mao’s China “self-reliance” was “an absolute virtue” that became an ideological pursuit and was politicized. "The all powerful ruler of the world's most populous nation wished to be perceived as a philosopher king who had no need to buttress any traditional symbol of majesty," Kissinger wrote. 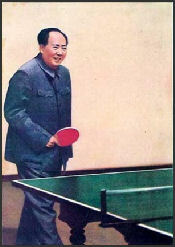 "Mao would rise from the center of a semicircle of easy chairs, a female attendant standing close to steady him (and, on my last visit, to hold him up)...He would fix upon his visitor a smile both penetrating and slightly mocking, as if to warn that there was no point trying to deceive this specialist in understanding and exploiting human weakness and duplicity." Book” "Mao: The Real Story," by Alexander V. Pantsov and Steven I. Levine (Simon & Schuster 2012), draws on Russian archives to show, more clearly than before, that this apparently unparalleled tale of cruel folly was not without precedent in the twentieth century--the age of ideological excess. "Mao's vast insulating security system was copied from the Soviets and his whereabouts's was always kept secret from all but the highest party leaders. His food was tasted for poison; and his private quarters were bugged without his knowledge. Whenever he went for a walk he never took the same route twice and the license plate on his car was constantly changed. The platforms of train stations were cleared when his train passed through and sometimes security guards were hired to act as hawkers so the stations didn't look 'so eerily empty.'" Mao ordered a 10-meter-long, six-door stretch Red Flag stretch limousine in the early 1970s. “'We must produce our own longest limousine,” he said. After several years the car was produced at the First Automobile Works in Jilin Province and was delivered just weeks before Mao died. Mao was the only one ever to be driven around in it. Large enough to hold 40 schoolchildren, the limousine was equipped with a refrigerator, color television, telephone, desk and a double sofa, one of which could be converted into a double bed. Henry Kissinger wrote, "Mao overshadowed all his subordinates by the near-religious awe in which he seemed to be held (or which his subordinates at least thought was wise to affect)." Nursery school toddlers used to walk around with the "Little Red Book" in their pockets; kindergarten children learned patriotic songs that praised Mao on their first day of school; huge concrete statues, with one armed raised in patriarchal salute to the masses, were in every town and city. People walked around with badges with the picture of the "Great Helmsmen," as Mao was known. 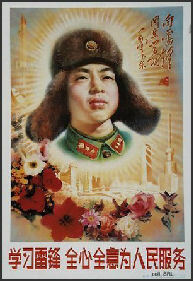 Mao's portrait hung in practically every shop, every house and every major public area in China. According to one government statistic there were 700 million portraits of Chairman Mao hanging on Chinese walls at the time of his death in 1976. 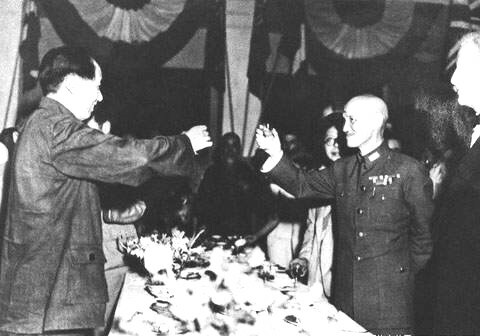 Orville Schell described Chinese politics from the mid 1950s until the mid 1970s as a "struggle between those who supported Mao's cult and those who feared it." Blemishing a Mao portrait is still a felony today. 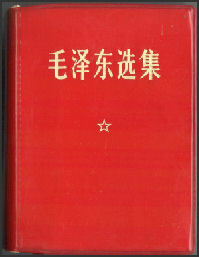 Mao's Selected Thoughts, a collection of sayings better known as The Little Red Book, was put together by Lin Biao in the Cultural Revolution. According to Time magazine, "No other book has had such a profound impact on so many people at the same time...If you read it enough it was supposed to change your brain.” Some of the passages of the Little Red Book were set to music and slogans like "Reactionaries are Paper Tigers" and "We Should Support Whatever the Enemy Opposes"! were painted everywhere on billboards and walls. Mao Zedong once said, There is no construction without destruction. Destroy first, and construction will follow. He extolled their Chinese peasantry for the blankness, observing that one can write beautiful things on a blank sheet of paper. On the matter of equal rights, Mao said "women hold up half the sky." 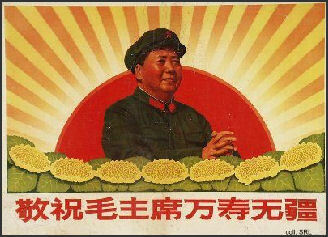 In regard to population growth, Mao said, "every mouth comes with two hands." The population of China doubled under his leadership. Mao reportedly once said that a loud fart is better than a long lecture. He shocked Kissinger by jokingly informing him that China was planning to send 10 million Chinese women to the United States. Mao told Nixon, "People like me sound a lot of big cannons. For example, things like, 'the whole world should unite and defeat imperialism, revisionism, and all reactionaries and establish socialism.” He then broke into a fit of laughter. Lei Feng poster Perhaps the most famous Communist propaganda device that appeared during the Mao period was the story Lei Feng, the Model Soldier, and the publications, media reports. slogans and posters associated with him. Reported to be a real person, Lei Feng was orphaned as child and felt indebted to the Communist Party for taking care of him. He joined the Communist Youth League at the age of seven and worked at a steel mill before he was allowed to become a soldier in the People's Liberation Army even though he was only five feet tall. Feng read Mao's writings nearly everyday and viewed himself as “a tiny screw.” In this diary, he wrote: "A man's usefulness to the revolutionary cause is like a screw in a machine. Though a screw is small, its use is beyond measure. I am willing to be a screw." He also reported wrote "A person’s life is limited but to serve the people is unlimited." Feng died at the of 22 in 1962 when his jeep ran into downed a utility pole. Afterwards his diary was "discovered" and Feng was elevated to the status of a "revolutionary icon." 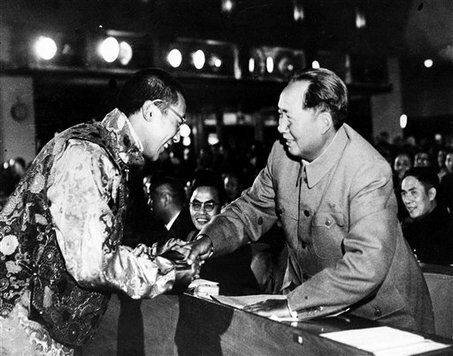 He became so famous that performing a good deed was refereed as "doing a Lei Feng." School children were taught the stories of his good deed; Mao said "Learn from Lei Feng;" and stores sold all kinds of Le Feng products. It is still not clear whether Lei and his diary were real or made up by the party. One of the more famous Lei Feng stories goes like this: one his friends was ill so Lei donated three liters of blood. against doctors orders to give only one, and used the $7 fee he received to buy medicine for his friend. Once, he received four sweet bean cakes as a New Year's presents and gave all four to injured miners. Another time he went without sleep for one night so he could wash a ton of cabbages and mop some floors. ‘some people call me a fool,” he wrote. “I want to be useful to people, useful to the country. If that makes me a fool, then the revolution needs more fools like me. The country’s development needs fools like me.” A group of Chinese has reportedly applied to the Guinness Book of World Records to have him recognized as the world’s most eulogized soldier. Lei Feng has been lionized in books, films and television documentaries and is resurrected from time to time as a role model. After almost being forgotten after the Cultural Revolution, Lei Feng was resurrected in 1991 by the Beijing municipal government, who gave out "Living Lei Feng" awards to model citizens. Some old timers still get weepy eyed about the kinder, gentler, simpler times associated with Feng. Periodically the Lei Feng ideal is questioned. In 1982, a university student Zhang Hua lost his life after jumping into a cesspool to save a peasant. His death sparked debate on the value of individual life just as Western values were being introduced to China through the open-door policy of the time. In 1988, a 14-year-old student Lai Ning died while fighting a forest fire aimed at protecting “national property” --- a satellite TV station. He was lauded later as a top teenager, but his death sparked a revaluation of life among the general public. After the incident, minors were not encouraged to risk their life for heroic deeds. 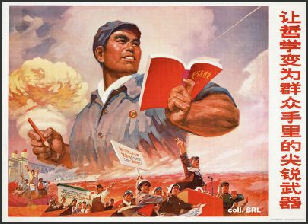 The Communists viewed literature and culture primarily as a propaganda devices. In a piece entitled Yan'an Talks of Art and Literature, Mao argued that literature was something that should be used for a revolutionary purposes. Most Communist literature is about peasants who overcome great odds to achieve great things. After Liberation in 1949, popular Chinese pulp novels were replaced by Communist books such as Red Star Heroes, We Fight Best When We March Our Hardest, After Reaping the Bumper Harvest and Grandma Sees Six Different Machines. Party line fables like The Foolish Man Who Removed the Mountains were known to everyone. It was several decades before the Ministries of Truth, Propaganda and Culture allowed romantic novels about Liberation soldiers who missed their girlfriends to be published. Social Realism art dominated the Mao era and the Cultural Revolution. Social Realism has been defined as "concrete representation of reality in its revolutionary development...in accordance with...ideological training of workers in the spirit of Socialism." It appeared in paintings hoisted in public and on posters splashed all over cities. Subjects in the works including spirited workers, heroic soldiers, uplifting leaders. Posters of "shock workers" (people who worked tirelessly for Socialism) show handsome, muscular men with smiles on their faces performing various kinds of menial chores in front of glistening factories.